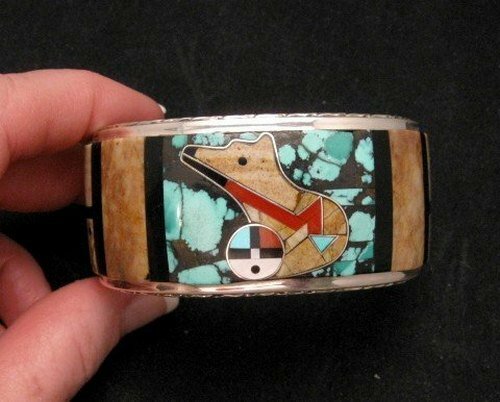 This is a top of the line Native American Zuni handmade heartline bear, sunface & pueblo design inlaid sterling silver bracelet, created by Gilbert Calavaza. 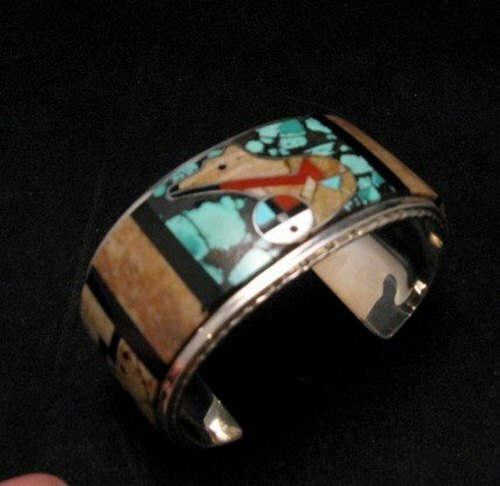 It's one of famous Zuni artist Gilbert Calavaza's signature inlay bracelets. 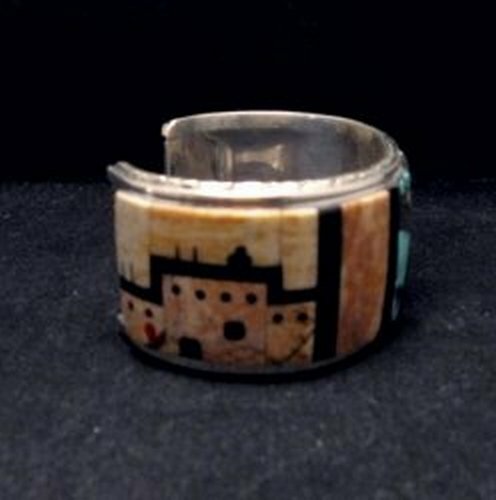 The bracelet depicts a heartline bear with a small sunface in front of it and there are pueblo scenes, done in Picasso marble, black jet, red coral, turquoise, Mother of Pearl and jasper, on either side. The bracelet is 1-1/4 wide. The bracelet terminals are recessed with twisted silver rope accents. The stone-to-stone inlay is impeccable and the sterling silver is sparkling. Please ignore the various reflections that can be seen in the bracelet, due to the highly polished stones and sterling silver. 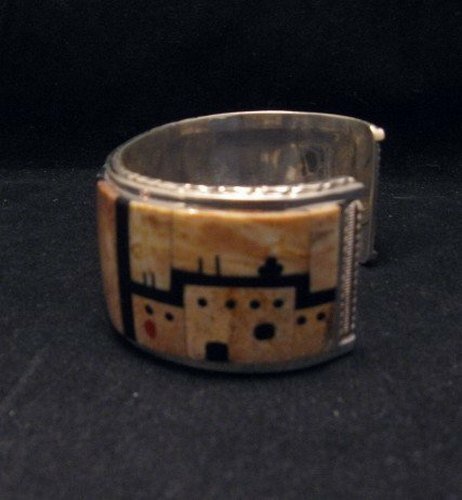 This is a top quality Zuni bracelet and you won't be disappointed with it. The bracelet measures 1-1/4 wide, the inside measurement is 5-3/4 inches end-to-end plus a non-adjustable opening gap of 1-1/2. It weighs 80 grams. As a reference, my wrist is 6 inches around and the bracelet is too large for me. Brand new and in perfect condition. Gift box and Certificate of Authenticity included with your purchase. Hallmarked GMC and Sterling. Gilbert is Effie Calavaza's (Effie C.) grandson.